Imagine if you will, the sounds of hooves striking the pavement as you make your way, to the wondrous surprise as your guests turn their heads to find the most magical of storybook sights. You arriving in an elegant Victorian carriage drawn by magnificent horses, driven by the most superbly dressed driver and attendant. You may think this is possible only in a fairy tale. Surprisingly, this dream is not so far away as you may have thought. With our wonderful livery company you can find a carriage service that will cater to each and every situation imaginable. Carriages for all occasions was started 10 years ago by Andrew Campbell. Andrew runs the company based from West Lothian, Scotland. Carriages for all occasions specialise in horse drawn carriages for all your special occasions. Popular venues include weddings, funerals, parties, prom nights and anniversaries. We have a choice of 8 horses and experienced Coachman and attendants. 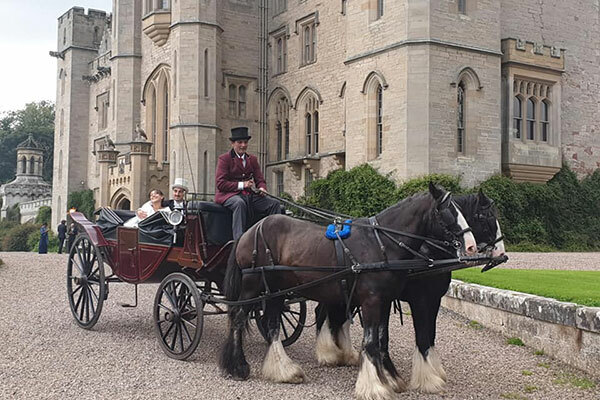 When considering a horse and carriage please bear in mind that our horses can pull the carriage a total of 7 miles per day. This is subject to the road conditions (ie hills, rough terrain) however we will always personally check a route once a booking has been made to avoid any disappointments on the day. If your planned route is further, you may like to consider spliiting the journey with another form of transport.